Atempo Time Navigator version 4.6.2 now available! Home | ATEMPO, THE BLOG CORNER | Atempo Time Navigator version 4.6.2 now available! Atempo, data protection, storage, movement and recovery specialist announces the availability of version 4.6.2 of Time Navigator. Tina is backup software for physical and virtual servers and applications to answer the needs of companies and their IT teams. "Atempo is constantly attentive to customer needs and also market trends. The latest features built into Time Navigator are exactly the ones our customers wanted to deal with exploding data volumes. Our R&D teams have created a solution which is simple and efficient to administrate and which enables IT Managers and their teams to save time and energy." Luc d’Urso, Atempo CEO. Over and above rapidly increasing data volumes to protect and store, we need to factor in the risks from cyberattacks, machines incidents, human error, natural disasters etc. There is a real need to install and use increasingly powerful system, application and file backup and restoration tools. Atempo R&D teams have enhanced their solution which has -and will continue to- evolve with customer requirements. Increased scalability. The environments to protect and the increase in data volumes are constantly on the rise. Tina enhancements have significantly improved the user experience. For example, the doubling of the size of the backup catalogue means we can restore data even more efficiently thanks to Time Navigation. Increased control. Tina is a recognized cornerstone in the backup of increasingly complex and diverse IT infrastructures. The solution interfaces via a single pane of glass all your physical and virtual environments to protect. Increased compatibility. Tina supports the latest versions of many OS and critical applications. In version 4.6.2, this includes: vSphere 6.7, NetApp ONTAP 9.3 (NDMP), Red Hat 7.5 / Cent OS 7.5 and SQL 2017. Deduplicated NetApp NAS backups: NetApp file managers can store several TBs of data with a low volume of change. Using file deduplication is central to reducing backup windows and also reducing the quantity of storage required for backup. Time Navigator only backs up new or modified data blocks. Atempo proposes global deduplication for all physical and virtual operating systems, applications and file systems. All Time Navigation agents are equiped to deduplicate at source (prior to the transfer to backup storage). Disaster Recovery Plans with a replication switch: once the data replication is activated, data retrieval in the event of an incident is performed automatically with no admin action required. Time Navigator automatically selects the closest available replica and restores with no outside intervention. Web Application (Administration): this new feature enables you to start the web admin interface which is now encapsulated in a single application available on Windows. It is not necessary to install Flash Player on the admin work station. The admin application is installed automatically with the product and runs directly via the Time Navigator program group. 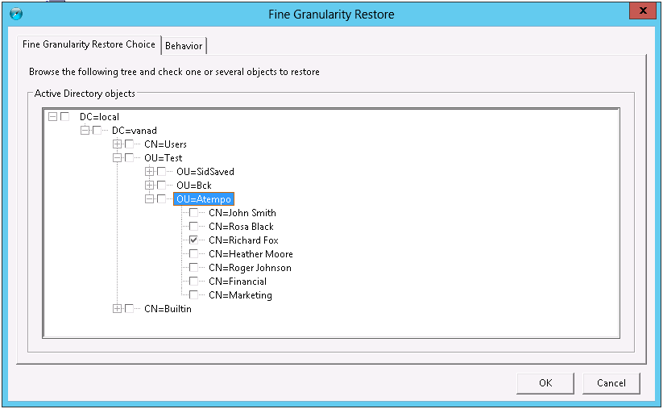 Granular Microsoft Active Directory recovery: SRA (System Recovery Agent) system backups for Windows allows you to perform a granular restoration of a single user or a group of users via an integrated graphical interface. Simply select the user/group from the Active Directory node and select the date to restore from. The advantage of this feature: a single backup for all Windows components. System state, registry data and the Active Directory are grouped into a single application for a simple and rapid restore. User Interface for Oracle RMAN Configuration: from the Web Admin interface, this feature simplifies the creation of backup scripts, step by step with the help of a graphical assistant and therefore minimizes the risks of human error. Support for new agents and operating systems among which: vSphere 6.7, NetApp ONTAP 9.3 (NDMP), Red Hat 7.5 / Cent OS 7.5 and SQL 2017. "This latest version 4.6.2 of Time Navigator, available today includes a large number of hotly awaited features for our customers and users. These features will help users strengthen their backup and restoration security mechanisms. Time Navigator will constantly adapt its role to meet user demands in terms of agility, performance and evolution", concludes Hervé Collard VP Marketing Atempo.